It has been a lovely autumn day to spend out in the garden. A bit windy perhaps but sunny and much warmer that I might have expected. 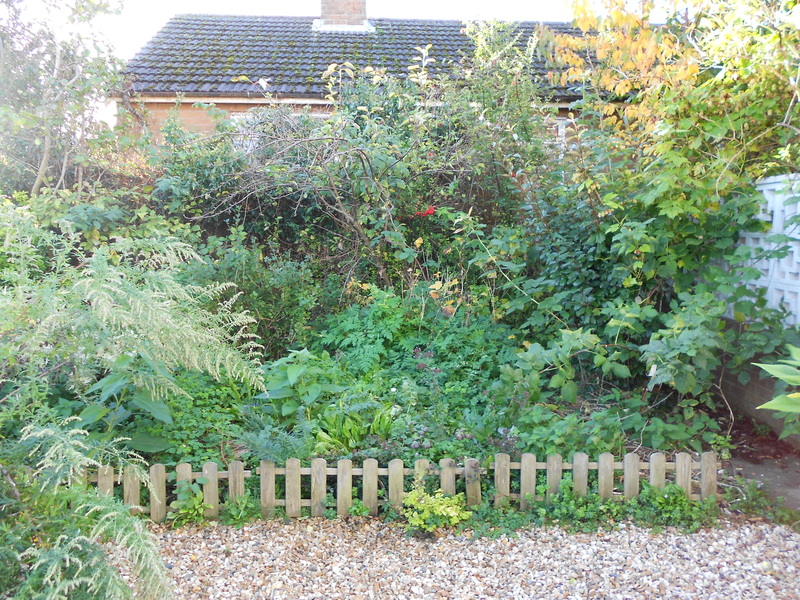 I spent the time tidying up mainly – cutting back lots of growth from some of the edges of the garden. Even though I removed a lot of growth, there is still a lot of greenery around. In the end I could not bear to remove too much, wanting the garden to continue to be a sanctuary for as many small creatures as possible. As I realised the day I first thought of the possiblity growing a perennial vegetable garden – nature can easily produce a lot of greenery. It is all part of her verdant fertility. I have tried over the years to nurture that fertility and gently guide it towards producing edible crops, hopefully increasing rather than diminishing it. I also took cuttings of jostaberry, blackcurrant, Nepalese raspberry and red Russian kale and dug up some clumps of wild raspberry, sorrel and spinach. 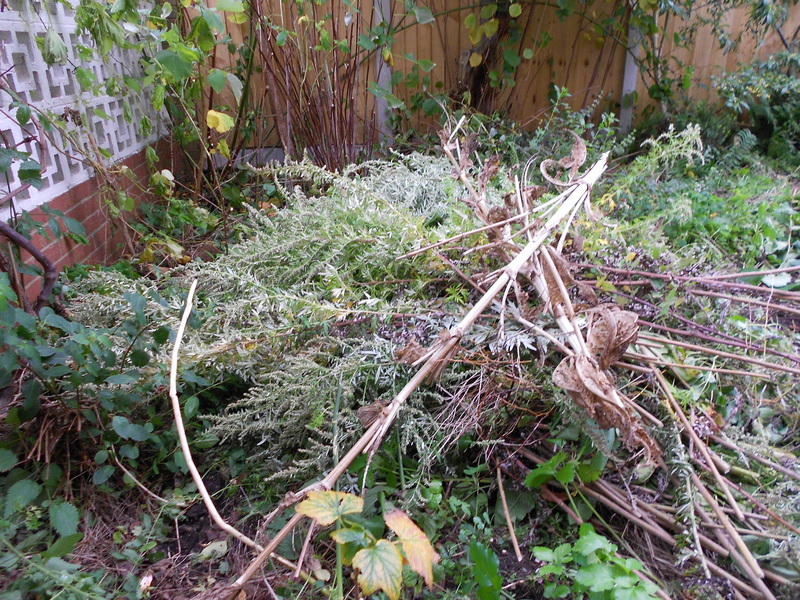 I harvested yacon and Jerusalem artichokes – a bit on the small side, but I won’t have much more time to gather them. In fact this may have been my last time working in this garden. After nearly 18 months on the market we have purchasers for the house. It has been a long wait and during that time I have struggled to know what to plant and what not to. In fact I have actually done and planted very little in this garden this year, preferring to spend most of my time and effort developing the Borderland garden. As I was out there working I had the family in mind who will soon be living here. They have described themselves as ‘not gardeners’ and I don’t know what they will make of what I have done here! I will be leaving them a copy of my book and a note about the garden as a bit of an explanation and then of course it is entirely up to them what they do. My partner has lived here over thirty years and I have been here for fourteen. We have done our bit of stewardship for the future and looked after it as best we could for the purposes that most suited us. 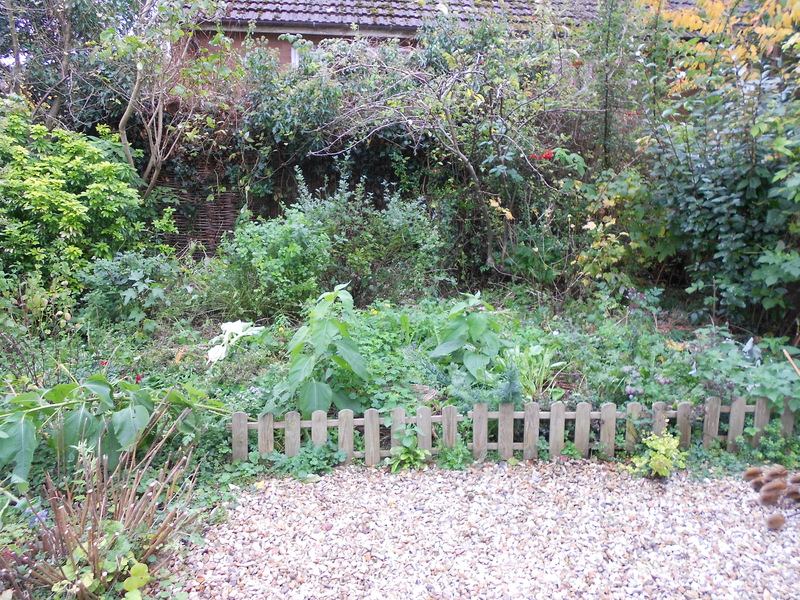 We are ‘downsizing’ and will be buying a flat in Shrewsbury – without a garden. Being at another defining life stage and handing over something precious into the care of another are stark reminders that everything has its time in the end the land is not ours at all. This entry was posted in Perennial Vegetables, Permaculture, Polycultures, Relationship with nature, Telford Garden. Bookmark the permalink. Thank you for your comment – I still have the garden in Wales at our holiday home. Two gardens is too much for us now! Well done. I don’t like to cut our allotment back too much yet either. Some of our neighbour’s plots are so very bare already.